Not to be confused with dyskinetic cerebral palsy. Rapid, involuntary movements of the limbs, torso, and fingers may also occur. In some cases, an individual's legs can be so affected that walking becomes difficult or impossible. These symptoms are the opposite of patients who are diagnosed with Parkinson's disease. Parkinson's patients have difficulty moving, whereas tardive dyskinesia patients have difficulty not moving. Respiratory irregularity, such as grunting and difficulty breathing, is another symptom associated with tardive dyskinesia, although studies have shown that the prevalence rate is relatively low. Tardive dyskinesia is often misdiagnosed as a mental illness rather than a neurological disorder, and as a result patients are prescribed neuroleptic drugs, which increase the probability that the patient will develop a severe and disabling case, and shortening the typical survival period. Other closely related neurological disorders have been recognized as variants of tardive dyskinesia. Tardive dystonia is similar to standard dystonia but permanent. Tardive akathisia involves painful feelings of inner tension and anxiety and a compulsive drive to move the body. In some extreme cases, afflicted individuals experience so much internal torture that they lose their ability to sit still. Tardive tourettism is a tic disorder featuring the same symptoms as Tourette syndrome. The two disorders are extremely close in nature and often can only be differentiated by the details of their respective onsets. Tardive myoclonus, a rare disorder, presents as brief jerks of muscles in the face, neck, trunk, and extremities. "AIMS Examination": This test is used when psychotropic medications have been prescribed because patients sometimes develop tardive dyskinesia due to prolonged use of antipsychotic medications. The Abnormal Involuntary Movement Scale (AIMS) examination is a test used to identify the symptoms of tardive dyskinesia (TD). The test is not meant to tell whether there is an absence or presence of tardive dyskinesia. It just scales to level of symptoms indicated by the actions observed. The levels range from none to severe. The AIMS examination was constructed in the 1970s to measure involuntary facial, trunk, and limb movements. It is best to do this test before and after the administration of the psychotropic drugs. Taking the AIMS consistently can help to track severity of TD over time. Tardive dyskinesia was first described in the 1950s shortly after the introduction of chlorpromazine and other antipsychotic drugs. However, the exact mechanism of the disorder remains largely uncertain. The most compelling line of evidence suggests that tardive dyskinesia may result primarily from neuroleptic-induced dopamine supersensitivity in the nigrostriatal pathway, with the D2 dopamine receptor being most affected. Neuroleptics act primarily on this dopamine system, and older neuroleptics, which have greater affinity for the D2 binding site, are associated with high risk for tardive dyskinesia. The D2 hypersensitivity hypothesis is also supported by evidence of a dose-response relationship, withdrawal effects, studies on D2 agonists and antagonists, animal studies, and genetic polymorphism research. Given similar doses of the same neuroleptic, differences among individuals still exist in the likelihood of developing tardive dyskinesia. Such individual differences may be due to genetic polymorphisms, which code for D2 receptor binding site affinity, or prior exposure to environmental toxins. Decreased functional reserve or cognitive dysfunction, associated with aging, mental retardation, alcohol and drug abuse, or traumatic head injuries, has also been shown to increase risk of developing the disorder among those treated with neuroleptics. Antipsychotic drugs can sometimes camouflage the signs of tardive dyskinesia from occurring in the early stages; this can happen from the individual having an increased dose of an antipsychotic drug. Often the symptoms of tardive dyskinesia are not apparent until the individual comes off of the antipsychotic drugs; however, when tardive dyskinesia worsens, the signs become visible. Other dopamine antagonists and antiemetics can cause tardive dyskinesia, such as metoclopramide and promethazine, used to treat gastrointestinal disorders. Atypical antipsychotics are considered lower-risk for causing TD than their typical counterparts with their relative rates of TD of 13.1% and 32.4% respectively in short-term trials with haloperidol being the main typical antipsychotic utilised in said trials. Quetiapine and clozapine are considered the lowest risk agents for precipitating TD. From 2008, there have been reported cases of the anti-psychotic medication aripiprazole, a partial agonist at D2 receptors, leading to tardive dyskinesia. As of 2013, reports of tardive dyskinesia in aripiprazole have grown in number. The available research seems to suggest that the concurrent prophylactic use of a neuroleptic and an antiparkinsonian drug is useless to avoid early extrapyramidal side-effects and may render the patient more sensitive to tardive dyskinesia. Since 1973 the use of these drugs has been found to be associated with the development of tardive dyskinesia. An increased risk of tardive dyskinesia has been associated with smoking in some studies, although a negative study does exist. There seems to be a cigarette smoke-exposure-dependent risk for TD in antipsychotic-treated patients. Elderly patients are also at a heightened risk for developing TD, as are females and those with organic brain injuries or diabetes mellitus and those with the negative symptoms of schizophrenia. TD is also more common in those that experience acute neurological side effects from antipsychotic drug treatment. Racial discrepancies in TD rate also exist, with Africans and African Americans having higher rates of TD after exposure to antipsychotics. Certain genetic risk factors for TD have been identified including polymorphisms in the genes encoding the D3, 5-HT2A and 5-HT2C receptors. Prevention of tardive dyskinesia is achieved by using the lowest effective dose of a neuroleptic for the shortest time. However, with diseases of chronic psychosis such as schizophrenia, this strategy must be balanced with the fact that increased dosages of neuroleptics are more beneficial in preventing recurrence of psychosis. If tardive dyskinesia is diagnosed, the causative drug should be discontinued. Tardive dyskinesia may persist after withdrawal of the drug for months, years or even permanently. Some studies suggest that physicians should consider using atypical antipsychotics as a substitute to typical antipsychotics for patients requiring medication. These agents are associated with fewer neuromotor side effects and a lower risk of developing tardive dyskinesia. Recent studies have tested the use of melatonin, high dosage vitamins, and different antioxidants in concurrence with antipsychotic drugs (often used to treat schizophrenia) as a way of preventing and treating tardive dyskinesia. Although further research is needed, studies reported a much lower percentage of individuals developing tardive dyskinesia than the current prevalence rate for those taking antipsychotic drugs. Currently, there are no FDA approved drugs for treating tardive dyskinesia, though some have shown efficacy in studies. Tetrabenazine, which is a dopamine depleting drug, is sometimes used to treat tardive dyskinesia and other movement disorders. However, it is only approved to treat chorea associated with Huntington's disease. The related VMAT2 inhibitor, reserpine, has also been tried in one small randomised double-blind placebo-controlled trial as a treatment for TD with success, as has α-methyldopa. Ondansetron (Zofran) has shown some benefit in experimental studies on tardive dyskinesia and a variety of anti-Parkinsonian medications are used such as donepezil, baclofen, and pramipexole. Clonidine may also be useful in the treatment of TD, although dose-limiting hypotension and sedation may hinder its usage. Botox injections are used for minor focal dystonia, but not in more advanced tardive dyskinesia. Benzodiazepines are an effective treatment for TD, however their use is limited by the development of tolerance which requires ever increasing doses of the benzodiazepines to be used to attenuate TD symptoms. The most popular benzodiazepine for the treatment of TD is clonazepam. Vitamin B6 has been reported to be an effective treatment for TD in two randomised double-blind placebo-controlled trials. In males, the branched-chain amino acid formula Tarvil, containing the amino acids valine, isoleucine, and leucine in a 3:3:4 ratio was reported as beneficial for motor symptoms in a small, non-blinded study. Tardive dyskinesia most commonly occurs in patients with psychiatric conditions who are treated with antipsychotic medications for many years. The average prevalence rate has been estimated to be around 30% for individuals taking antipsychotic medication, such as that used to treat schizophrenia. A study being conducted at the Yale University School of Medicine has estimated that "32% of patients develop persistent tics after 5 years on major tranquilizers, 57% by 15 years, and 68% by 25 years." More drastic data was found during a longitudinal study conducted on individuals 45 years of age and older who were taking antipsychotic drugs. According to this research study, 26% of patients developed tardive dyskinesia after just one year on the medication. Another 60% of this at-risk group developed the disorder after 3 years, and 23% developed severe cases of tardive dyskinesia within 3 years. According to these estimates, the majority of patients will eventually develop the disorder if they remain on the drugs long enough. Elderly patients are more prone to develop tardive dyskinesia, and elderly women are more at-risk than elderly men. The risk is much lower for younger men and women, and also more equal across the sexes. Patients who have undergone electro-convulsive therapy or have a history of diabetes or alcohol abuse also have a higher risk of developing tardive dyskinesia. Several studies have recently been conducted comparing the prevalence rate of tardive dyskinesia with second generation, or more modern, antipsychotic drugs to that of first generation drugs. The newer antipsychotics appear to have a substantially reduced potential for causing tardive dyskinesia. However, some studies express concern that the prevalence rate has decreased far less than expected, cautioning against the overestimation of the safety of modern antipsychotics. A physician can evaluate and diagnose a patient with tardive dyskinesia by conducting a systematic examination. The physician should ask the patient to relax, and look for symptoms like facial grimacing, eye or lip movements, tics, respiratory irregularities, and tongue movements. In some cases, patients experience nutritional problems, so a physician can also look for a gain or loss in weight. ↑ Breggin, Peter. "Tardive Dyskinesia Legal Settlement". 1 2 3 "Tardive Dyskinesia". Medscape Reference. WebMD. 9 February 2012. Retrieved 25 November 2013. ↑ Yassa, R.; Lal, S. (1986). "Respiratory irregularity and tardive dyskinesia a prevalence study". Acta Psychiatrica Scandinavica. 73 (5): 506–10. doi:10.1111/j.1600-0447.1986.tb02717.x. PMID 2875609. ↑ Yassa, Ramzy; Jones, Barry D. (1985). "Complications of tardive dyskinesia: A review". Psychosomatics. 26 (4): 305–7, 310, 312–3. doi:10.1016/S0033-3182(85)72863-0. PMID 2859630. ↑ Dean, C. E.; Thuras, P. D. (2009). "Mortality and tardive dyskinesia: Long-term study using the US National Death Index". The British Journal of Psychiatry. 194 (4): 360–4. doi:10.1192/bjp.bp.108.049395. PMID 19336789. ↑ Baldessarini, Ross J. (1988). "A summary of current knowledge of tardive dyskinesia". L'Encéphale. 14 (Spec Issue): 263–8. PMID 2905654. 1 2 3 Hoerger, Michael. "The primacy of neuroleptic-Induced D2 receptor hypersensitivity in tardive dyskinesia". ↑ Ross, Colin A; Read, John (2004). "Antipsychotic medication: myths and facts". In Read, John; Mosher, Loren R.; Bentall, Richard P. Models of Madness: Psychological, Social and Biological Approaches to Schizophrenia. London: Brunner-Routledge. pp. 101–14. ISBN 978-1-58391-906-4. 1 2 3 4 Rana, AQ; Chaudry, ZM; Blanchet, PJ (November 2013). "New and emerging treatments for symptomatic tardive dyskinesia" (PDF). Drug Design, Development and Therapy. 7: 1329–40. doi:10.2147/DDDT.S32328. PMC 3825689 . PMID 24235816. ↑ Alexander, C; Power, P (2008). "A case of aripiprazole and tardive dyskinesia". Journal of Psychopharmacology. 23 (2): 214–5. doi:10.1177/0269881108089591. PMID 18515468. ↑ Alexander, J (Mar 2013). "Aripiprazole induced tardive dyskinesia-accruing evidence". Aust N Z J Psychiatry. 47 (3): 289–90. doi:10.1177/0004867412461058. PMID 22990431. ↑ Crane, GE (1973). "Is tardive dyskinesia a drug effect?". The American Journal of Psychiatry. 130 (9): 1043–44. PMID 4727768. ↑ Crane, GE (1973). "Rapid reversal of tardive dyskinesia". The American Journal of Psychiatry. 130 (10): 1159. doi:10.1176/ajp.130.10.1159. PMID 4728916. ↑ Yassa, R; Lal, S; Korpassy, A; Ally, J (January 1987). "Nicotine exposure and tardive dyskinesia". Biological Psychiatry. 22 (1): 67–72. doi:10.1016/0006-3223(87)90131-4. PMID 3790642. ↑ Chong, SA; Tan, EC; Tan, CH; Mythily (May 2003). "Smoking and tardive dyskinesia: lack of involvement of the CYP1A2 gene". J Psychiatry Neurosci. 28 (3): 185–89. PMC 161742 . PMID 12790158. ↑ Zhang, XY; Yu, YQ; Sun, S; Zhang, X; Li, W; Xiu, MH; Chen da, C; Yang, FD; Zhu, F; Kosten, TA; Kosten, TR (August 2011). "Smoking and tardive dyskinesia in male patients with chronic schizophrenia". Progress in Neuro-Psychopharmacology and Biological Psychiatry. 35 (7): 1765–69. doi:10.1016/j.pnpbp.2011.06.006. PMID 21723906. ↑ Diehl, A; Reinhard, I; Schmitt, A; Mann, K; Gattaz, WF (January 2009). "Does the degree of smoking effect the severity of tardive dyskinesia? A longitudinal clinical trial". European Psychiatry. 24 (1): 33–40. doi:10.1016/j.eurpsy.2008.07.007. PMID 18774276. ↑ Segman, RH; Heresco-Levy, U; Finkel, B; Inbar, R; Neeman, T; Schlafman, M; Dorevitch, A; Yakir, A; Lerner, A; Goltser, T; Shelevoy, A; Lerer, B (November 2000). "Association between the serotonin 2C receptor gene and tardive dyskinesia in chronic schizophrenia: additive contribution of 5-HT2Cser and DRD3gly alleles to susceptibility" (PDF). Psychopharmacology (Berl). 152 (4): 408–13. doi:10.1007/s002130000521. ↑ Rauchverger, B; Isakov, V; Jabarin, M (2007). "Olanzapine-induced tardive dystonia successfully treated by tetrabenazine". The Journal of neuropsychiatry and clinical neurosciences. 19 (4): 484–5. doi:10.1176/appi.neuropsych.19.4.484-a. PMID 18070868. ↑ Fernandez, Hubert H.; Friedman, Joseph H. (2003). "Classification and Treatment of Tardive Syndromes". The Neurologist. 9 (1): 16–27. doi:10.1097/01.nrl.0000038585.58012.97. PMID 12801428. 1 2 3 Saltz, Bruce L.; Robinson, Delbert G.; Woerner, Margaret G. (2004). "Recognizing and Managing Antipsychotic Drug Treatment Side Effects in the Elderly". Primary Care Companion to the Journal of Clinical Psychiatry. 6 (Suppl 2): 14–9. PMC 487007 . PMID 16001096. 1 2 Huang, CC; Wang, RI; Hasegawa, A; Alverno, L (1981). 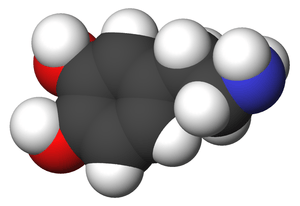 "Reserpine and alpha-methyldopa in the treatment of tardive dyskinesia" (PDF). Psychopharmacology (Berl). 73 (4): 359–62. doi:10.1007/BF00426466. PMID 6789358. ↑ Caroff, SN; Campbell, EC; Havey, J; Sullivan, KA; Mann, SC; Gallop, R (October 2001). "Treatment of tardive dyskinesia with donepezil: a pilot study". Journal of Clinical Psychiatry. 62 (10): 772–775. doi:10.4088/JCP.v62n1004. PMID 11816865. ↑ Ogunmefun, A; Hasnain, M; Alam, A; Osuala, T; Regenold, WT (February 2009). "Effect of donepezil on tardive dyskinesia". Journal of Clinical Psychopharmacology. 29 (1): 102–04. doi:10.1097/JCP.0b013e3181934475. PMID 19142126. ↑ Korsgaard, S (July 1986). "Baclofen (Lioresal) in the treatment of neuroleptic-induced tardive dyskinesia". Acta Psychiatrica Scandinavica. 54 (1): 17–24. doi:10.1111/j.1600-0447.1976.tb00090.x. PMID 782159. ↑ Gerlach, J; Rye, T; Kristjansen, P (March 1978). "Effect of baclofen on tardive dyskinesia" (PDF). Psychopharmacology (Berl). 56 (2): 145–51. doi:10.1007/BF00431840. PMID 417365. ↑ Stewart, RM; Rollins, J; Beckham, B; Roffman, M (December 1982). "Baclofen in tardive dyskinesia patients maintained on neuroleptics". Clinical Neuropharmacology. 5 (4): 365–73. doi:10.1097/00002826-198212000-00004. PMID 6130838. ↑ Erkan, A; Pirildar, S; Acarer, A; Akdeniz, F (2011). "Efficacy of Low-dose Pramipexole Augmentation in the Treatment of Refractory Psychotic Depression Complicated with Tardive Dyskinesia A Case Report" (PDF). Bulletin of Clinical Psychopharmacology (in Turkish). 21 (4): 353–55. doi:10.5455/bcp.20111029071711. ↑ Aia, PG; Revuelta, GJ; Cloud, LJ; Factor, SA (2011). "Tardive Dyskinesia" (PDF). Current Treatment Options in Neurology. 13 (3): 231–41. doi:10.1007/s11940-011-0117-x. PMID 21365202. ↑ Brasic, James Robert (February 9, 2012). Benbadis, Selim, R, ed. "Tardive Dyskinesia". eMedicine. ↑ Bhoopathi, Paranthaman Sethupathi; Soares-Weiser, Karla (2006). Bhoopathi, Paranthaman Sethupathi, ed. "Benzodiazepines for neuroleptic-induced tardive dyskinesia". Cochrane Database of Systematic Reviews (3): CD000205. doi:10.1002/14651858.CD000205. PMID 16855954. ↑ Lerner, V; Miodownik, C; Kaptsan, A; Cohen, H; Matar, M; Loewenthal, U; Kotler, M (September 2001). "Vitamin B6 in the Treatment of Tardive Dyskinesia: A Double-Blind, Placebo-Controlled, Crossover Study" (PDF). The American Journal of Psychiatry. 158 (9): 1511–14. doi:10.1176/appi.ajp.158.9.1511. PMID 11532741. ↑ Lerner, V; Miodownik, C; Kaptsan, A; Bersudsky, Y; Libov, I; Sela BA; Witztum, E (November 2007). "Vitamin B6 treatment for tardive dyskinesia: a randomized, double-blind, placebo-controlled, crossover study". Journal of Clinical Psychiatry. 68 (11): 1648–54. doi:10.4088/jcp.v68n1103. PMID 18052557. ↑ Richardson, Mary Ann; Bevans, Margaret L.; Read, Laura L.; et al. (2003). "Efficacy of the Branched-Chain Amino Acids in the Treatment of Tardive Dyskinesia in Men". American Journal of Psychiatry. 160 (6): 1117–24. doi:10.1176/appi.ajp.160.6.1117. PMID 12777270. ↑ Llorca, Pierre-Michel; Chereau, Isabelle; Bayle, Frank-Jean; et al. (2002). "Tardive dyskinesias and antipsychotics: A review". European Psychiatry. 17 (3): 129–38. doi:10.1016/S0924-9338(02)00647-8. PMID 12052573. ↑ Glenmullen, Joseph (2001). Prozac Backlash: Overcoming the Dangers of Prozac, Zoloft, Paxil, and Other Antidepressants With Safe, Effective Alternatives. New York: Simon & Schuster. p. 38. ISBN 978-0-7432-0062-2. ::referring to Glazer, William M.; Morgenstern, Hal; Doucette, John T. (1993). "Predicting the long-term risk of tardive dyskinesia in outpatients maintained on neuroleptic medications". Journal of Clinical Psychiatry. 54 (4): 133–9. PMID 8098030. ↑ Jeste, Dilip V.; Caligiuri, Michael P.; Paulsen, Jane S.; et al. (1995). "Risk of Tardive Dyskinesia in Older Patients: A Prospective Longitudinal Study of 266 Outpatients". Archives of General Psychiatry. 52 (9): 756–65. doi:10.1001/archpsyc.1995.03950210050010. PMID 7654127. ↑ Whitaker, Robert (2002). Mad in America: Bad Science, Bad Medicine, and the Enduring Mistreatment of the Mentally Ill. Perseus. ↑ Marshall, DL; Hazlet, TK; Gardner, JS; et al. (2002). "Neuroleptic drug exposure and incidence of tardive dyskinesia: A records-based case-control study". Journal of managed care pharmacy. 8 (4): 259–65. PMID 14613418. ↑ Tarsy, Daniel; Lungu, Codrin; Baldessarini, Ross J. (2011). "Epidemiology of tardive dyskinesia before and during the era of modern antipsychotic drugs". In Vinken, P. J.; Bruyn, G. W. Handbook of Clinical Neurology. Hyperkinetic Movement Disorders. 100. pp. 601–16. doi:10.1016/B978-0-444-52014-2.00043-4. ISBN 978-0-444-52014-2. PMID 21496610. ↑ Jeste, Dilip V.; Caligiuri, Michael P. (1993). "Tardive Dyskinesia". Schizophrenia Bulletin. 19 (2): 303–15. doi:10.1093/schbul/19.2.303. PMID 8100643.